The common bluebottle has shattered a vision record. An surprising new study has found that a species of swallowtail butterfly in Australasia has some incredible eyes. The butterfly holds the record for the most different vision cells of any insect known to man, according to a statement accompanying a new study published in the journal Frontiers in Ecology and Evolution. 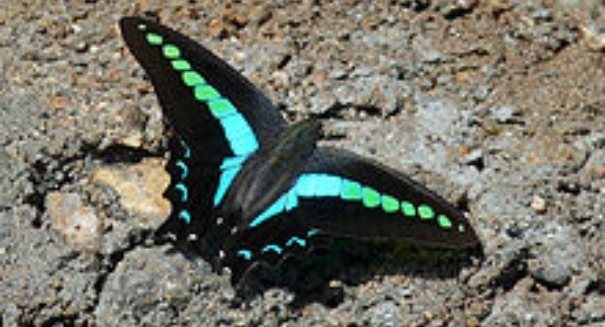 The common bluebottle, which is a type of swallowtail butterfly, has at least 15 classes of vision cells known as photoreceptors, easily beating the old record of nine. These photoreceptors are used to sense color, brightness, shape and movement, according to the statement. How do humans compare? We have four classes of photoreceptors, including three types of color vision that we call cones, as well as rods, which help us see shape, movement and changes in light. In comparison, the bluebottle has seven cells for color alone. Researchers were able to mark the location of the cells with a special kind of dye. Other types of vision cells were found on the upper side of the eye that helps them see green light and detect rapid movement, helping them avoid predators. “We have studied color vision in many insects for many years, and we knew that the number of photoreceptors varies greatly from species to species. But this discovery of 15 classes in one eye was really stunning,” Kentaro Arikawa, Professor of Biology at Sokendai (the Graduate University for Advanced Studies) in Hayama, Japan and lead author of the study, said in the statement. These incredible butterflies can even see types of light that are invisible to us. “Butterflies may have a slightly lower visual acuity than ourselves, but in many respects they enjoy a clear advantage over us: they have a very large visual field, a superior ability to pursue fast-moving objects and can even distinguish ultraviolet and polarized light. Isn’t it fascinating to imagine how these butterflies see their world?” Arikawa said.